Yeah, I know. Word clouds don’t tell the whole story, or even an accurate story. 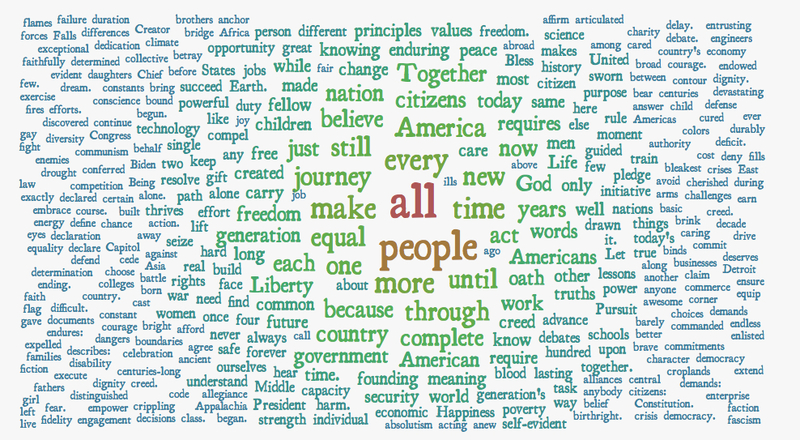 But I had a fun few minutes playing with Word it Out and President Obama’s inauguration speech. The program lets you add up to 728 words and then cherry pick what words to include, weight them by count and choose how to order them. It automagically discards articles and punctuation, too, and lets you edit either list of included and excluded words. I used about 350 and as incomplete as it is, you still get a flavor of the speech – from the words “gay” “fight” “diversity” at the far left edge to “principles” “values” “enduring peace” top center and “faction and “fascism” in the far right bottom corner. You can check out the full transcript of his 2013 inauguration – which included mentions of Seneca Falls, Selma and Stonewall – here. And for an amazing take on frequently used words in US presidential inauguration speeches, check out Santiago Ortiz’s stunning work.